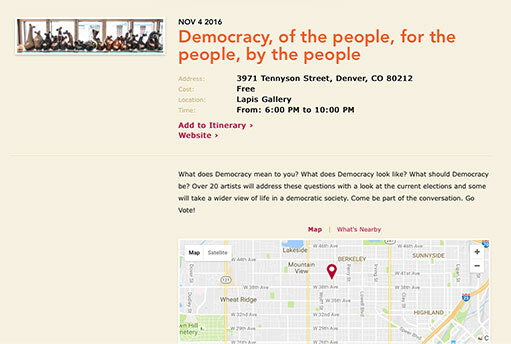 The Tennyson Street Cultural District hosts the longest running art walk in Denver. 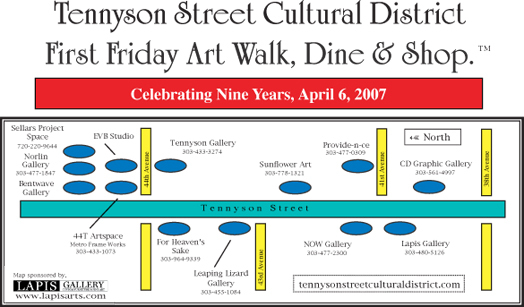 The TSCD celebrated its 10th year of the Tennyson Street First Friday Art Walk, Dine and Stroll on April 6th 2008. Multiple galleries, creative retail boutiques, fine restaurants and artists' studios host art openings every first Friday of the month (all year long). The TSCD isn't only active during the first Friday festivities. It is also a vibrant community every day of the week. The neighborhood is packed with a variety of spaces offering most anything that you need for daily living. These privately owned businesses are not only proud to offer their unique products to the community but do so with the best customer services in the Denver area. Did you know- for every dollar spent in the Tennyson Street Cultural District, 42 cents stays in the neighborhood while for every dollar spent at the mall or at one of the large chain stores, only 12 cents goes back into the neighborhood?